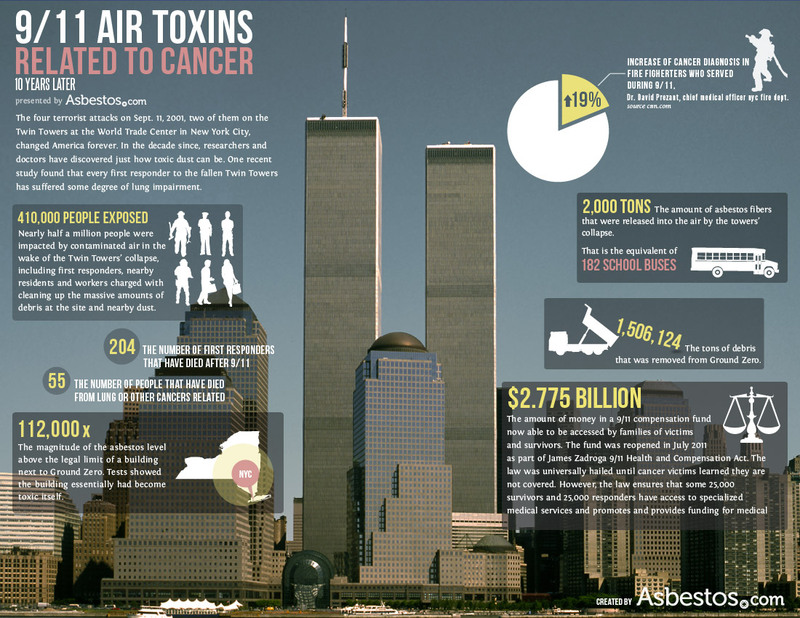 Asbestos was part of the 9/11 WTC story. Is asbestos really deadly, or is it just another hoax to rebuild and cost millions and billions? [2:16 PM] Zal: could this have been the tuberculosis thing? [2:17 PM] TomD27: me too. [2:18 PM] TomD27: It’s one of those things that seems quite believable to me. It makes sense. [2:19 PM] TomD27: that said, i remain open. I have to. [2:22 PM] More_Questions_Than_Answers: Have any of you peeps listened to the newest audio where Rollo is talking to PShea? [2:24 PM] Zal: “As New York City’s World Trade Center collapsed following the September 11 attacks, Lower Manhattan was blanketed in a mixture of building debris and combustible materials. This complex mixture gave rise to the concern that thousands of residents and workers in the area would be exposed to known hazards in the air and in the dust, such as asbestos, lead, glass fibers, and pulverized concrete. More than 1,000 tons of asbestos are thought to have been released into the air following the buildings’ destruction. Inhalation of a mixture of asbestos and other toxicants is thought to be linked to the unusually high death rate from cancer of emergency service workers since the disaster. Thousands more are now thought to be at risk of developing cancer due to this exposure with those who have died so far being only the ‘tip of the iceberg’. Some commentators have criticised authorities for using asbestos in the buildings’ construction. [2:28 PM] More_Questions_Than_Answers: There’s a part I found funny where PShea brings up the idea that it was queer that Simon Shack dismissed the flat earth idea from the start being that it’s such an important subject. If I’m right, there’s a part where he is going to say that Simon’s work on the subject included ‘psycho-babble’, but then he decides it’s not the right thing to say and changes it mid sentence only to burble weird sounds instead. Rollo didn’t catch it. Then he speaks awkwardly for a few seconds as if he knows he made a boo-boo. I’ve got a time stamp if anyone wants to confirm later? I may be wrong but it sounded funny to me. [2:32 PM] More_Questions_Than_Answers: I have no problem about his opinion of Simon Shack. I just found it funny that he didn’t want to use those words and made a strange sound instead. [2:33 PM] More_Questions_Than_Answers: Sorry, you can go back to talking about Asbestos, didn’t mean to interrupt. [2:36 PM] Zal: wasnt jlb the main guy opposing khams bigger ball theory? [2:38 PM] napoleon wilson: siri ? [2:49 PM] Justsayindude: Sorry to hark back to asbestos Zal, if you were finished with it, but I will just table a theory I have held for a very long time now. As previously mentioned, fibreglass insulation is much worse. Asbestos has not innate toxicity, in the sense that it is not chemically toxic, it is structurally toxic. The fibres are so small they can penetrate the cell nucleus and this causes the cell to mutate. Fibreglass is capable of the exact same thing, but it is (in NZ) coated with 7 different chemicals, of which 5 are known carcingoens (from memory). When asbsestos got fingered as the number one evil bad guy causing all (ALL) of these bad conditions, the corporate produced fibreglass industry was instantly off the hook. In addition to that, massive amounts of MASONRY was moved world wide to get rid of this ultra evil, totally natural product. Replacing all asbestos (used in thousands of products) required hundreds of replacements, super expensive comparatively, from folks like 3M (Minnesota Mining and Minerals) MMM HMMM, Dow Chemicals, and so on. One law, Trillions to the corporates. THe fibreglass industry has been suppressing info on their products for decades, just like tobacco etc. Billions of tons of glass fibre sold per year. Here endeth the rant, but I reckon that sums up the asbestos scam. [3:00 PM] More_Questions_Than_Answers: But if Asbestos was safer compared to fibre glass, why would they choose to end the production of it? Surely there was still money to be had in its usage, why did the controlled media allow the negative press to proliferate? [3:01 PM] More_Questions_Than_Answers: Could it have been in-fightnig at top levels of business? [3:06 PM] More_Questions_Than_Answers: For sure, we never get the full truth on these things. [3:25 PM] More_Questions_Than_Answers: One individual on Reddit stated: Asbestos removal is a hyped-up scam. It’s perfectly safe just sitting up in the ceiling. It’s not until workers rip the ceiling down that particles are scattered everywhere. So much money has been pumped into disinformation campaigns by these companies it should be a crime. Next week: the mold abatement scam industry. [3:27 PM] More_Questions_Than_Answers: It seems there are legitimate long term dangers of breathing it in from what I can grasp. [3:28 PM] More_Questions_Than_Answers: Another Reddit user said: Keep in mind, one brief exposure isn’t how people get sick. Its from prolonged exposure, typically 5+ years of everyday exposure. [4:04 PM] anounceofsaltperday: Most chrysotile was mined from a town in Quebec called “Asbestos”… a very lovely french speaking place. [4:05 PM] anounceofsaltperday: Some of the text i have placed here is showing as red text on my screen.. does anyone know why? [4:15 PM] anounceofsaltperday: @napoleon wilson do you have a link? John Adams returns to Our Interesting Times to discuss his research regarding historical myths and culture creation. We discuss two books: Michael Kammen’s Mystic Chords of Memory and Jules Henry’s Culture Against Men. We talk about how the oligarchs create and exploit historical myths to perpetuate their rule and the roles propaganda, advertising, mass trauma and technology have played in creating mass culture. John is a researcher and co-host of The Afternoon Commute, a podcast regularly featured on Hoax Busters Call. *Please consider a donation to support this podcast. [4:16 PM] anounceofsaltperday: @napoleon wilson are you the founder of “Our Interesting Times”? [4:17 PM] napoleon wilson: ? [4:29 PM] typoerror: jumping bath etc. Regissør Erik Poppe skal lage film om terroren som ble begått på Utøya 22. juli 2011, melder NRK. Panels on the outside of Grenfell Tower are suspected to have hastened the spread of the blaze which killed at least 79 people. [4:33 PM] Justsayindude: 11 towers! [4:34 PM] Zal: something needs to be done about these firehazards !!!! This entry was posted in 9/11 on June 22, 2017 by ab. We know that bound asbestos, contained in building materials such as plaster or fibre board, was present in Grenfell Tower in ceilings and header panels inside airing cupboards. It is possible that very small amounts of asbestos fibres will have been dispersed within the smoke plume but would have formed only a small fraction of the smoke and particles released in the fire; all smoke is toxic and any asbestos would present a minimal additional risk to health. So no claims expected from the various heroes involved.